This reminds us of our independence day and how with so much struggle we have gained our independence. It not only constricts our memories to our human martyrs but also our four-legged pals who have truly served this country to achieve our independence. In true sense celebrating this day is by taking a special care of them. Then why not work upon it. Independence day means a lot of noise and commotion going around. Normally, pets face stress and anxiety during such loud noises. To control their nerves and keep them in right mood, why not keep them in a quiet place or bring those special headphones for your dog. Making them part of this celebration would not be much stressful with those headphones on their ears. It will not only reduce the loud unwanted noise disturbing the pet but also the soulful music will keep your pet calm. Bringing your dog/cat treats quadruples their joy. But ensure that you do not give any of the human treats – like chocolates, sweets or pastries. These are not meant for your furry companion and are dangerously toxic for them. Better look for chews and treats that are specially assorted for your canine/feline friends. When it comes to fireworks, you need to keep them safely away from it. Pets are quite sensitive to loud noises, flashing lights and strong smells. So, during celebration on fourth of July, better leave your pet indoors, probably with TV or radio on. Independence Day comes in summer and taking your pooch outside in the celebration is precarious due to high temperatures. This can put your pet at the risk of heat stroke. If you find anything unusual with your pet, immediately act upon it taking him/her to the vet office. Added to this, never leave your pet alone in the parked car, even if the day is not too warm. The temperature outside may seem low but inside the car the temperature usually arises above 10 degrees compared to the temperature in the environment. And, this can prove fatal if your pet is left more than an hour’s time. During the Independence celebration week, many companies come up with pet supplies sale. Rather than going for any local pet product, which are of low quality, check for the brand products in such sales. At Pet Care Supplies Independence Day Sale, we offer high quality and brand products to ensure complete safety and health of your furry companions. To make this Independence Day special for you and your four-legged lovable companions, we have come with surprising discounts on a range of exclusive pet products. Check our site for more info on SALE! Let not alone you celebrate but making it more special for your pet pal grab the special Independence Day discount on various products. 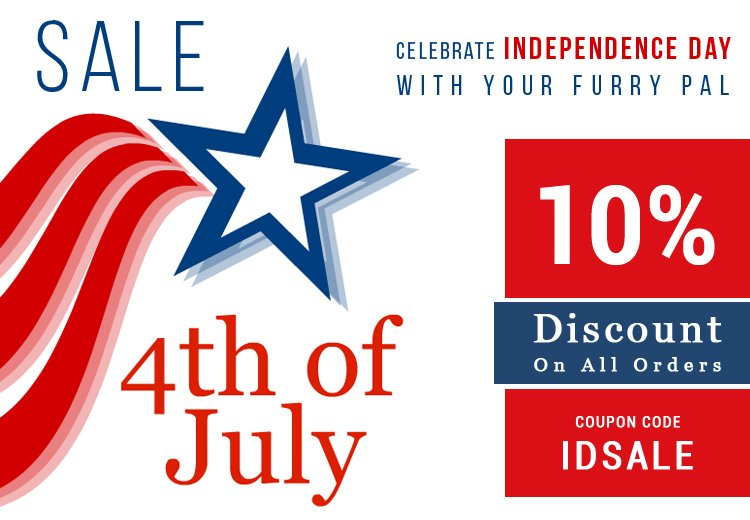 Use coupon code “IDSALE” and get flat 10% off on all Pet Care Supplies.